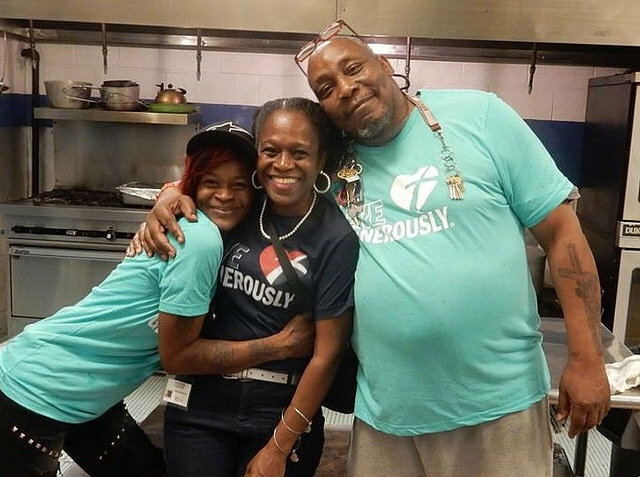 Nyhisha T. Gibbs (pictured in the middle), a Brooklyn native, joined Dutchess Outreach two years ago. She is responsible for recruiting volunteers from the community. Courtesy of Nyhisha T. Gibbs. According to Professor of Sociology Leonard Nevarez’s community food assessment report in 2013, the food insecurity rate in the City of Poughkeepsie was 26.8 percent. This one-in-four households average was higher than the national standard (Digital Window, “Food Security and Choice: Poughkeepsie Plenty Community Food Assessment,” 01.01.2013). Dutchess Outreach is one of the non-profit organizations in Poughkeepsie that helps to address the problem at hand. In 1982, Dutchess Outreach initiated The Lunch Box, a community meal program that provides a free, hot lunch and dinner five days a week for anyone in Dutchess County. In 2016, the program had over 1,000 volunteers and served more than 180,000 meals. In addition, Gibbs conducts Community Outreach visits at local high schools, colleges and libraries, aiming to spread awareness about the importance of volunteer services through educational institutions. A number of Vassar College librarians have joined the program during these visits. Volunteers include local residents and students from Vassar, Marist and the Culinary Institute of America. “We are so grateful that the Vassar College community has been involved,” Gibbs added. The program unites people from the community to work toward the same purpose—building an inclusive neighborhood through distributing locally farmed foods. Gibbs pointed out that the program not only benefits the community with food assistance and relief, but also has a positive impact on the individual participants. She commented, “One of the highlights is hearing the feedback from the volunteers. The term ‘volunesia (noun)—the moment when you forget that you are volunteering to help change lives; because it is changing yours’ is truly fitting.” It’s a rewarding experience to make a difference in the community as well as in one’s own mentality. In Dutchess Outreach’s Fall 2018 newsletter, Gibbs reminded readers that “Caring is always in season,” and working with The Lunch Box is one way that Vassar students and members of the larger Poughkeepsie community may put this spirit into action. To learn more about registering as a volunteer for The Lunch Box, visit their website at dutchessoutreach.org. If you’d like to join the Vassar group that’s regularly prepping and serving dinner at the Lunch Box, please contact Gretchen Lieb ([email protected]).